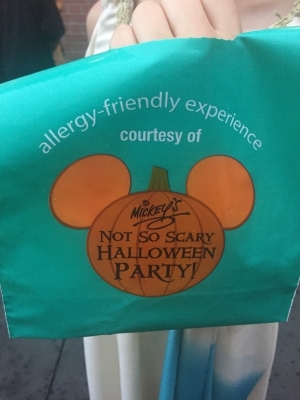 Today I learned that Walt Disney World has special program at Mickey’s Not So Scary Halloween. If your child has an allergy they can collect special tokens in teal bags. (They provide everything). This way they can trick or treat with the other kids. Then at the end, they go to a special room in the park where they can turn in the tokens for allergy-friendly candies that the parent’s approve of!